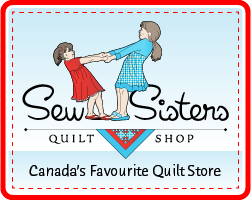 Quilt Matters: Double the Pleasure, Double the Fun Giveaway! Double the Pleasure, Double the Fun Giveaway! Welcome to the Blog Hop Party and the Sew Mama Sew Giveaway Day Giveaways! This is my first time party-cipating (yeah, pretty bad, eh?) in a giveaway party like this. Looks like a lot of fun! For those of you who are new to my blog, welcome! 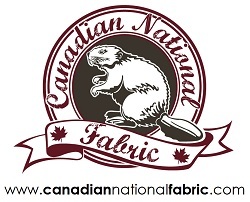 I'm a quilter from Ottawa, Canada. I'm currently at home with my three young boys (2.5, 4.5 and 7 -- you have to get the partial years in, I'm told). I started this blog in May and am having a great time meeting other quilters from around the world. Laura from Quokka Quilts and I started TGIFF! (Thank Goodness it's Finished, Friday!) a couple of months ago. It's a touring linky party for quilty finishes. We're having a blast -- and getting more projects finished to boot! I'm hosting this week and the wonderful and cheeky Lucy from Charm About You is hosting next week. If you have a finish in any given week, you are more than welcome to join in on the fun! You can also host if you like too. Check out the TGIFF! site for more details. 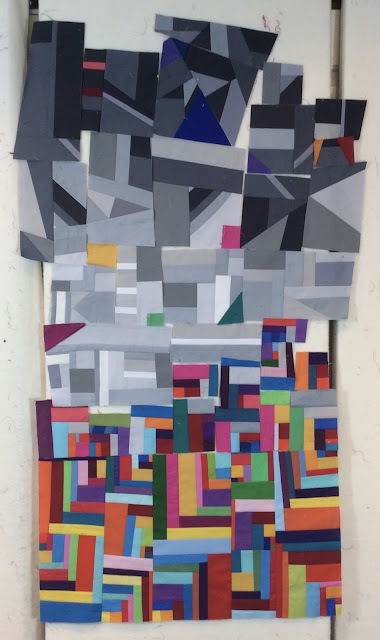 Another thing I do is travel the quilting blogosphere. I haven't done it in a couple of months because my computer is soooo slow, but we recently got a new computer and I'm feeling the travel bug again. I've got a few ideas for making these more visual trips for readers too. 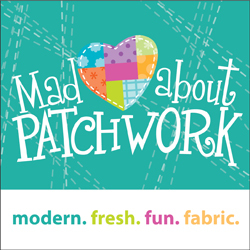 There are two giveaways, one for the Quilting Gallery's Blog Hop Party and Sew Mama Sew's Giveaway Day and your comments will count for both! Giveaway #1: A charm pack of 48 6" I spy squares. I use these packs to make my Wee Spy Quilts. With a 3" border, these squares make a 39" by 48" top. There are a variety of colours and novelty fabrics that attract wee ones' eyes. No two squares are alike. The best part? This top is so scrappy that you can use any colour or fabric as the border and backing and it works. Giveaway #2: This Makower UK Make It Yourself Advent Calendar panel. I've made five of these Makower UK's Advent Calendars and I have to say that they are very easy and fast to do. The directions (provided on the panel) are clear and concise. 1) Leave a comment on your favourite travel destination or which country (or province or state) you think I should visit virtually next. 2) Leave a comment letting me know that you are a follower or have become a new follower of my blog. 3) Leave a comment letting me know that you are a TGIFF! follower or have become a TGIFF! follower. 4) Come back on Monday, when I add a fourth entry option for the Sew Mama Sew Giveaway Day Giveaway. Leave a comment about a goal you have for 2012. I am traveling next year with our caravan to Hungary and Roemenia. I am a follower of your blog. I love that you called me cheeky ;) One of my favourite words!! I am a TGIFF! follower and hoping not to steal that crown from Erin ;) - clearly joking, she did an awesome job! Hi M-R I am a follower of your blog. Thanks for a chance to win your wonderful prizes! I love Canada and have been a lot of places in Canada, but I would love to explore some more. I think we have a pretty interesting and diverse country. But if I could ever talk DH into going somewhere else Ireland would be my first pick. I am drawn to that country for reasons unknown. You have to visit Cuba...I love it there!! You must visit Zion National park in Utah, The views are breath taking. I was fortunate enough to visit in person in October and I'm ready to go back and do some more hiking. I'm a follower of Quilt Matters. I'm also a follower of TGIFF. I actually have something to link up as soon as it comes out of the dryer and I get some pictures! If you haven't been to the prairies (easterners often just fly over it to get to the Pacific coast), you really should visit Saskatoon and some of the other parts of Saskatchewan. The prairies has a free, open kind of beauty ... good for clearing the mind and feeding the spirit. You really must visit Ireland - we go every year - a wonderful country! My favourite travel destination is the ocean. Any nice beach on a warm day would make me happy. I'm a Quilt Matters follower. My favorite destination is right here in Queensland. You should defiantly come here and stop in and visit my at the same time. I am also a TGIFF follower!! I would love to go to Greece or Spain! I have been to visit some of the East coast of Canada but St-John's NL has a special place in my heart (probably cuz I have family there!) Thanks for the opportunity! Come on down to Australia. Enjoy our warm summer weather - it's good ! I am a follower and my favourite destination is Malaysia. Come to Scotland especially if it is a virtual visit then the weather would not be a problem it is snowing as I write. Scotland has much more to offer than the weather! Ireland, Scotland and New Zealand. Entry 1 - love those fabrics, both giveaways! Thanks for the chance! Entry 2 - I'm a follower - love your blog! Entry 3 - will become a TGIFF follower in the New Year, right now, just not enough time to fit it all in. If this doesn't qualify, oh, well, I already have 2 other chances LOL! hmmm.... i think hawaii was my favorite vacation destination, but rome is my favorite tourist destination! adding you to my google reader! I would love to visit Hawaii. It is so beautiful! Thanks for the giveaway chance. I am a new follower. Thanks for the giveaway chance. I am a new follower! I got a big laugh when I read you had to start a blog in order to have someone to talk quilts with. I can't tell you how many times I started talking quilts to my peers and watched their eyes glaze over! How wonderful to have the Quilting Gallery that brings us quilters together. I loves Japan..I think you should visit too.. I like to stay in the US. We would like to take our motorhome on a trip out west (Arizona Wyoming...all the way to California). That probably won't happen until my son is 9 or 10. (He's 4 now). I love tulips, so I have always wanted to go to Holland. Of course, I have been to the tulip festival in Ottawa many times! Thanks for the giveaway. I live in NC but I'm born and raised in Denmark, so I always want to go back home more than I get to do. 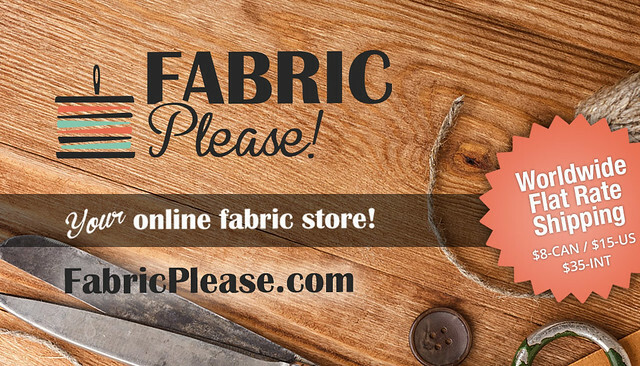 I'm going to India in April, and you can bet I'll be fabric shopping! And I'm a TGIFF follower too. I like visiting warm climates. I would love to check out Savannah and Charleston. We spent a week in Maui, Hawaii. It was beautiful - weather was perfect - so much to see & do. Thanks for the chance to win. I'm a new TGIFF follower. Thanks for the chance to win. I think my favourite destination is Italy, especially the Cinque Terre..beautiful there. Well, I live in Portugal and I think you should consider a visit, preferably not just virtually :) You can start here: http://www.visitportugal.com/Cultures/EN-US/default.html. Hope you enjoy! I just became a TGIFF! follower! I'd have to say my favorite traveling destination now is Montana. That's where I traveled to meet my Husband and now it's where lots of good family and friends are. My favorite place to have a vacation is 1000 islands. we stayed in ALexandria Bay, NY and had the best time. My kids were 10 years to 19 years and every one of them said they wanted to go back again. My favorite travel destination is SW Florida (Naples up to St Pete Beach area) but I live in Barranquilla, Colombia. You can find lots of virtual info on my blog about both! Hello! I am your new follower. I live in Croatia, Europe so I think you should see our country, it is really beautiful. I am also TGIFF follower. No virtual travel allowed!!! You must come to Australia. My favourite places are the vast outback, the beaches and the mountains. I love the beaches in Summer, the mountains in Spring and Autumn and the outback in Winter. We've been doing an actual tour of Ontario, and every year a different place for the last 4 years or so. We have plans for New Brunswick next year. So do love my country for it's diversity and variations of landscapes. I think you should visit Florida! I say you should give Scotland a try. Alaska is beautiful! Thanks for the giveaway! Merry Christmas! Scotland is one place I think would be lovely to visit! I keep thinking about making an eye spy quilt, just havent done it yet! I'm a follower :) thanks for the giveaway! My favorite blog travel destination is Australia, I just love how those quilters put color together. It is also the destination I want to go to in person, everything about it looks great. I loved Thailand. And Barcelonia. Dying to travel the Rhine or Danube, love the medieval towns and castles. Have fun in your journeyings. I just like staying home....grin. I absolutely loved the motorcycle trip I did in the Canary Islands - of course, my favorite place to visit is my mom's house! One of my goals for 2012 is to make more clothes for myself. You should visit Washington DC. So many things to see and do! my goal for 2012 is to sew more. I just signed on as a follower. I just signed up to follow TGIFF. Walking outside everyday is my goal for 2012. I'd love to travel the US looking for quilt block barns. I've just moved to Missouri and found that there is the Boonslick region about 2 hours from me, I'll have to go check it out. Although I like Ontario very much, the province I recommend most highly is Nova Scotia.I think it is the most beautiful of all the places I have traveled. I would recommend Australia or Japan but I have never been. The quilting I have seen from those places is unlike any other. i would love to conquer FMQ! want to go to china!! Cinque Terre, Italy. So beautiful! I'm now a follower - and also live in the Ottawa area! Favourite country I've visited (twice now) is New Zealand. On the "to visit" list - the Baltic area of Europe on a cruise or Scandinavia! Thanks for a great giveaway! I would love to go back to Vancouver Island, Canada. I miss it a lot. In 2012, I'm going to learn to knit socks! Merry Christmas! I live in North Carolina, USA, which I can highly recommend. We've got mountains on one side and the beach on the other, so we get to enjoy a nice variety. Favorite travel destination: The Houston quilt show, of course! Quilters' Nirvana, except for tired feet! I would love to get to Hawaii - that would be a dream vacation for me! My favourite holiday destination is North East Queenland in Australia - must see the Great Barrier Reef! 1) go see india! especially hyderabad, agra and cochin. 4) goal.. start my postgrad. at least next year. Explore the state of New Mexico. It is filled with little known fabulous places and not nearly as crowded with tourists. It still ranks as our favorite vacation ever and we have enjoyed a lot of great ones already. Visit Nairobi. You will love it. I love travelling in Europe, particularly France and behind the Iron Curtain. Then again New Zealand is beautiful too!! Next year I would like to learn to screen print! You've got to visit Loch Lomond! Gorgeous! This coming year, I want to make at least one quilt! That's a pretty big deal for a grad student. I don't have an area to direct you to but I always like to see the blogs, websites, ect of the people who are from Maine, USA because that is where I am from. So my suggestion would be virtually visit a place from your childhood. It's interesting to find all the quilters there that I never knew about. I love your I-spy bundle. My son (almost 2.5) loves I-spy. Thank-you for your chance to win! One of my goals for 2012 is to open another shop on Etsy to sell bags and purses. Thanks for the chance! My goal for next year it to make my first commissioned quilt. I would love to go to The English Isles. You should see Oregon, it is very pretty!! Our hobby is to hike the high point of every state. You'll see places you will never find in a guidebook! I love Cambodia, beautiful country and people, we liked it so much we went back to get married there. If you haven't traveled to Alaska! GO! NOW!........spent 3 months there, fantastic! Wonderful giveaway, I live in British Columbia but I think you should visit all the way to the other side of Canada to the Atlantic Provinces. Newfoundland, Nova Scotia and New Brunswick. there are some very talented quilters. I have traveled to many states and countries. I find beauty and interesting sites everywhere I have been. You should so explore the Barrington Tops National Park in NSW Australia. It is so beautiful. So much of Australia is so beautiful (not that I am a biased Aussie or anything). My Goal for 2012 is to learn to make a quilt. I have started hand piecing my first square and next year I want to turn that skill into a whole quilt and learn to finish it properly. If you haven't visited Alberta, Canada then you should ASAP. 2012, I absolutely must find a way to get a little sewing done every day. Germany in the christmas time. there is nothing like it! I spent a week in London. Such a great city! Russia is amazing! so is most of Eastern Europe - well, probably all of it but I haven't visited it all! My goal for 2012 is to stay stressfree and so not give myself too many goals! Well you really must visit The Gap. You can do so virtually via my blog or my podcast or you can do so physically because it is a gorgeous place to be. Thanks for your generosity. I am a follower of TGIFF - I am actually scheduled to host in March. goal for 2012 - lots of finishing...I am hosting a Finish A Long on my blog. Thanks for a great giveaway. I Love Southeast Alaska in the US-Sitka in particular. It has moody weather and is so beautiful. I would definitely travel south for the winter but I don't think it will ever happen. Thanks for the chance to win. I would love to visit Australia one day. Great giveaway. I have become a TGIFF follower...My goal is to finish the one I'm on by Friday! My goal for 2012 is to do at least 2 sewing/quilting projects a month. Last year I was in Italy, in ORVIETO, for the Sue Spargo class. Both , class and town were stunning!!!! I loved it, you should go there ! And I follow you ! A goal for next year ? To find a house and home for me and my three ! Something nice, payable. I loved the Cayman Islands, Grand Cayman for our honeymoon. I would love to go back there! I love visiting the castles in Germany!